LONDON--(BUSINESS WIRE)--Technavio market research analysts forecast the global project logistics market to grow at a CAGR of more than 2% during the forecast period, according to their latest report. The market study covers the present scenario and growth prospects of the global project logistics market for 2017-2021. The report also lists APAC, EMEA, and the Americas as the three main geographical segments. The demand for logistic services depends on several factors including economic growth and new government policies. The market was dominated by APAC with a market share of close to 42% and was followed by EMEA and the Americas. The global project logistics market witnessed a tremendous growth in construction projects in 2016 from the previous years and is expected to increase significantly during the forecast period. For instance, a gain of around 10% is expected from the construction of non-residential buildings in the US by 2021. 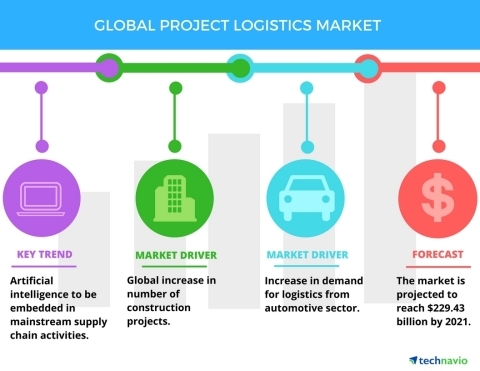 The increase in the number of construction projects and economic growth is expected to drive the demand for global project logistics services during the forecast period. Technology plays an important role in helping the industry realize its revenue goals by enabling advanced and enhanced design, planning, and construction. It is difficult for companies to carry out complete logistics operations for very large projects. The need for project logistics service providers is largely from the construction sector as constructing a huge plant or factory is a big task for any company. Shortage of skilled drivers, difficulties in managing the fleet, and lack of IT infrastructure such as transportation management system (TMS) as well as operational issues are some of the problems that shippers face if they opt for in-house management of project logistics. Such activities compel companies to divert their focus from core business areas. “The increasing complexities of supply chain management for large manufacturing companies is leading to the growth of the project logistics market. Project logistics companies enable manufacturing and construction companies to save costs, increase their operational efficiency, and focus on their core competencies,” says Sharan. Global automobile production has increased by more than 22 million units since 2010 and is expected to increase by more than 20 million units by 2021. China is expected to dominate the automobile production market, followed by North America. North America has an advantage in the automobile sector as it attracts foreign investments, which have increased the demand for the construction of new automotive production plants, thus increasing the demand for project logistics in the country. The growing demand for automobiles requires additional production units. For instance, Tesla has built a 5.5-million-square-foot production facility for vehicle production in Fremont, California, US, and is expected to expand the size of the facility to 13-million-square-feet by 2018. This, in turn, will lead to the growth in demand for project logistics. Technavio market research analysts forecast the global project logistics market to grow at a CAGR of over 2% during the forecast period, 2017-2021.